Liberia has been given $800, 000 to enhace teachers’ education in the country under the UNESCO-China Funds-in Trust Teachers Education Project for teacher Infomation, Communication and Technology (ICT) in Africa. The funds, according to Liberian education experts will be used to enhance and improve the country’s teacher training program through the pedagogic use of ICT in its pre-service and in-servide training programs. 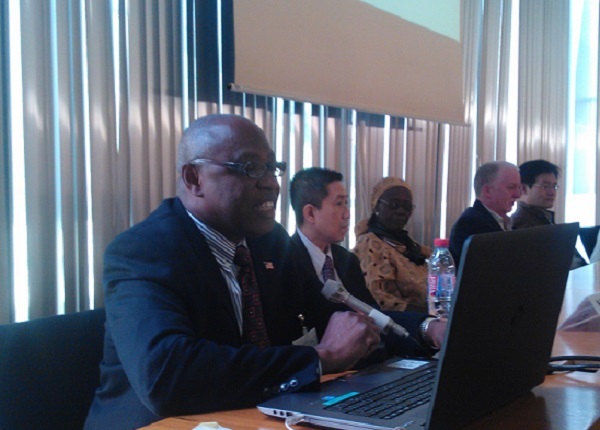 Making a presentation recently at the fund’s assesement forum in Paris, France, Assistant Education Minister for Teachers’ Education Moses Jackson and Euphemia Abdullai, dean of the University of Liberia Teacher College m said the money will be spent on teachers training institutions to develop and improve the skills, knowledge and competency of Liberian teachers. Assistant Minister Jackson and Dean Abdullai said the fund will further be used to strengthen and modernize the ICT infrastructure and facilities of teachers training institutions at the University of Liberia, the Zorzor Rural Teachers Training Institute, the Kakata Rural Teachers Trainning Institute and the Webo Rural Teachers Insititute.The project in the immediate term will attempt to identify different areas to be improved including, programs and courses, teachers educators, infrastructure and facilities as well as project and management.In the future, the project will build the national capacity of institutions on how to improve the programs and courses especially the first two-year programs of B.Sc in universities and C-Certificate programs in rural teachers training institutions in line with competent regional and national institutions. The project will also identify the relevant resources, individuals and institutions to provide trainings for initial trainings for teachers educators and ensure that government takes charge of the maintenance and sustainability of the project along with existing national initiatives and relevant stakeholders. The project agreement is to support the capacity development needs of the African countries, namely, Democratic Republic of Congo, Republic of Congo, Tanzania, Uganda, and Liberia in relations to teachers’ education and professional development. The project also aims to accelerate progress toward the attainment of quality Education for All and the educated-related Millennium Development Goals (MDGs), by enhancing the capacity of teachers’ education system to train adequate numbers of qualified teachers in beneficiary countries. Under the project, the beneficiary countries will enhance the capacity of their teachers training institutions by improving existing pre-service programs and schemes, particularly through Information and Communication Technology (ICT) supported distance training program, strengthening teachers continuous in-service professional development, particularly through blended learning modalities and programs scaling-up successful (ITC) supported innovations. This project was as a result of a visit paid to UNESCO headquarters in Paris, France, last year by Liberia’s Education Minister Etmonia Tarpeh when she held discussions with senior level UNESCO officials.